If you’ve got a multi-touch gesture enabled Apple notebook computer, you should take a look at the MultiClutch preference pane from Will Henderson. This preference pane lets you assign multitouch gestures (like Swipe Left/Right, pinch, rotate) to keyboard shortcuts on a per-application basis. You can also assign these gestures to global system-wide keyboard shortcuts. This lets you take gestures that normally only work in Apple applications, like swipe left/right for forward/back in Safari, and use them in other applications like Firefox. In the screenshot to the right, I’ve taken swipe up/down and set it to switch between tabs in my iChat chat window. This feels like the type of thing that should be built into the system, but until it is, Will Henderson has provided an excellent (and free!) tool. I Tryed to use this application with my macbook3,1 2.2ghz and i cant seem to get uit to work, any tips and does it ever work? 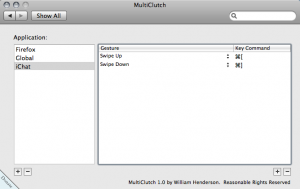 I saw this article, “MultiClutch for your MacBook,” and skimmed the link and proceeded with the download. From what I can tell, MultiClutch does not work on the brand-new aluminum case MacBooks (this is as of Dec. 3, 2008). Hence, the title of this article is very misleading. I don’t think I’m being misleading with the title. 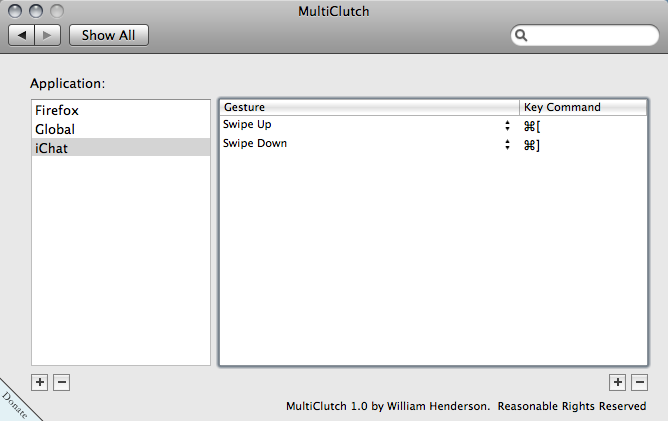 I’m using Multiclutch with no problems on my new Uni-body (Late 2008) Macbook Pro. The new Macbooks have the exact same trackpad hardware, so I don’t think there will be a difference with compatibility. I don’t have a new (aluminum) Macbook to test it on though, so if anyone has tried it please let me know. I did note that you need a “multi-touch” capable Macbook (includes, as you noted, the Air, Macbook Pro, but also the new Macbook). I hope that helps clear up any confusion. I think your Macbook may be too old to support the multi-touch gestures. If you can rotate, zoom, and swipe with your trackpad already, then Multiclutch should work and you may be running into another issue. If you cannot do those things already, then your computer doesn’t have the right features to use Multiclutch. I owe you an apology. After trying to use multiclutch unsuccessfully, I read in a different article that multiclutch does not work for the any macbooks (regular macbooks, not pros/airs). This information is old. With the application not working and with reading that it was not supposed to work to begin with, I assumed what I read applied to my MacBook. I was wrong. Apparently the application *does* work on the new macbook unibody/aluminum-case (this is what I am using). Unfortunately, it does not work for any of the applications that I wanted it to work for, which is why I didn’t think it worked at all. Mostly, I wanted it to work with Firefox, which is does not (for me at least, Firefox v3.0.4). I *really* want to use gestures in Firefox, so this is a disappointment. I’ve even tried downloading Firefox v3.1b2 (the 2nd beta version of Firefox 3.1) which *does* have some built-in non-customizable gestures — unfortunately the tab-switching feature of v3.1b2 is beyond unusable for me. The finger-rotate-to-switch-tabs results in a seizure of activity as the screen sporadically switches focus between tabs. Accidental triggers of this also occur when I attempt to zoom-in/zoom-out. Bummer. No problem Adam, thanks for the follow up, and I see where you were coming from. I’m using Multiclutch with Firefox 3.0.4 without issue, but I can’t think what could be causing your problems. I did have trouble the first time I installed Multiclutch. I deleted it from my preference pane and reinstalled, and everything has been stable since. Hey everybody! I thought the application needed a group in Facebook in to get the appreciation it deserves. Join now and invite yours friend, all macbook users should be aware of this awesome program!